Cloud adoption for all Unified Communications applications will increase in 2015. Business and IT advantages—such as reducing capital costs, enabling more participation and improving agility—are driving deployment growth. 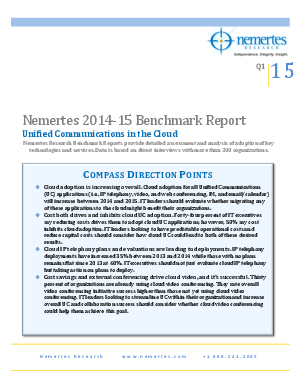 Windstream presents this download of the Nemertes 2014-15 Benchmark Report that provides a detailed assessment of UC in the cloud. In this report, you will gain valuable insight on cloud adoption for UC—across industries and around the globe.